Last year, AAA Members saved nearly one billion dollars! 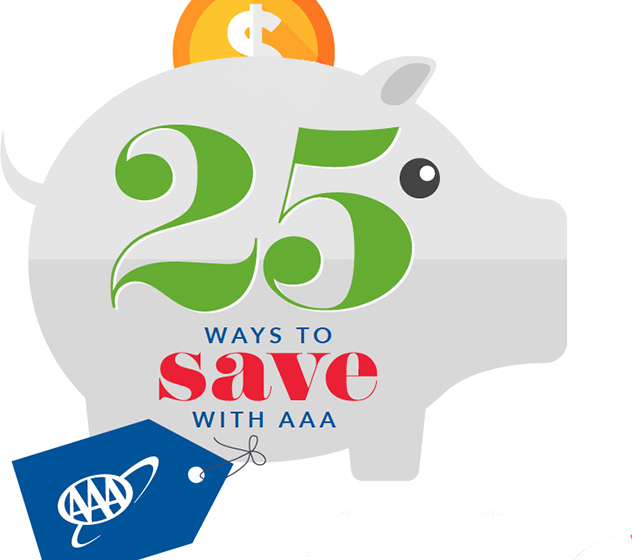 Here’s how you can save with AAA discounts this year! 1. Save 10% on parts and accessories at NAPA Auto Parts. Visit AAA.com/NAPA. 2. Save 10% off the purchase of four tires and receive FREE shipping to any AAA Car Care location in the Carolinas. Visit AAA.com/CarCare. 3. You can save thousands of dollars on a new or used vehicle AND you’ll save time by not having to go from place to place for a vehicle (plus we deliver). Visit AAA.com/AutoSales. 4. Towing is FREE for AAA Members (worth up to $109). Based on plan benefit. 5. FREE flat tire change for AAA Members (worth $67). 6. Save up 20% to on auto and home insurance. Visit AAA.com/GoQuote. 7. FREE dessert at Dressler’s restaurant and 10% off food and non-alcoholic beverages at Landry’s (AAA.com/Landrys), Margaritaville and Hard Rock Cafe restaurants (AAA.com/HardRock). 8. Receive $25 off retail tax preparation services at H & R Block or Block Advisors offices. Visit AAA.com/HRBlock. 9. Get your first month FREE at SpareFoot Self Storage and receive a $20 Amazon gift card (estimated savings of $100). Visit AAA.com/SpareFoot. 10. Get 12% off one way and local truck rentals when reserving online or by phone. Visit AAA.com/Penske. 11. Receive 15% off on eligible printing and packing services and save 5% on shipping costs at UPS Store. Visit AAA.com/UPS. 13. Save 15% and get 30 days free. Visit AAA.com/LifeLock. 14. FREE AAA Membership renewal for active Sprint customers (save at least $49). Visit AAA.com/Sprint. 15. AAA Members save 10% on Traffic Safety driving classes. Visit AAA.com/Safety to register today! 15.1. Legal Defense Reimbursement is available if you receive a speeding ticket and meet the criteria. Members can be reimbursed $50 for Basic, $100 for Plus and $300 for Premier Members. Call 877-282-3682 for details. 16. You have a FREE AAA Travel Agent at your service! AAA is the world’s largest travel agency, and we can make sure you get the best deals on the planet! 17. Save $300 on a cruise with AmaWaterways River Cruises when booking through AAA. 18. Save $155 per person on small group escorted tours with Alexander + Roberts when booking through AAA. Visit AAA.com/AlexanderRoberts. 19. TourBooks and maps are ($20.90 savings). FREE for AAA Members. 20. Save up to 50% off name brand luggage at AAA Travel Stores. 21. Premier and Plus Members can get their passport photos FREE ($12 savings). 22. Save up to $10 (adult) and $4 (youth) on Biltmore Estate admission (when you purchase tickets through your local AAA Travel office). 23. Save $2 (adult) and $2 (youth) on your admission to Grandfather Mountain and Chimney Rock State Park (Chimney Rock discount is for up to 6 guests total, including AAA Member). Save on tickets to Riverbanks Zoo & Garden ($2.75) and Waccatee Zoo (10% off general admission). 24. Last year, AAA Members saved over $108,000 on standard hotel rates with “Unlock More Savings” on AAA.com. 25. Get a 10% discount on airport rides with SuperShuttle and ExecuCar. Visit AAA.com/SuperShuttle. For more discounts, visit AAA.com/Discounts. If you have questions regarding AAA discounts, call your local AAA office. See page 5 for phone numbers and locations. *Sample savings — actual savings may vary. Use #MyAAASavings and share your AAA discounts deal on Facebook, Instagram or Twitter!